In this area, you will find your songs, grouped into songbooks. Songs are sorted by title or by number. In the search box, type the song number, or some keywords from the title or the lyrics. Excluded songbooks will appear grayed out and all their songs will be excluded from the search. 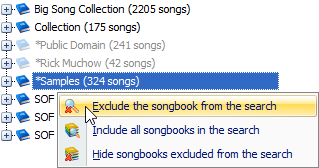 You can even hide excluded songbooks, again via their context menu. 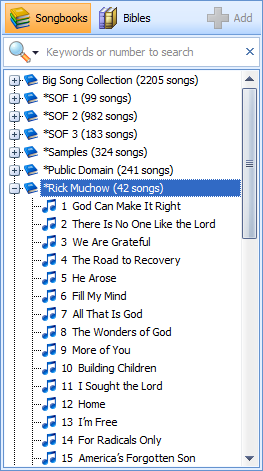 In the above example, the grayed out songbooks “Public Domain” and “Rick Muchow” are excluded from the search and they disappear automatically while you search for a song. 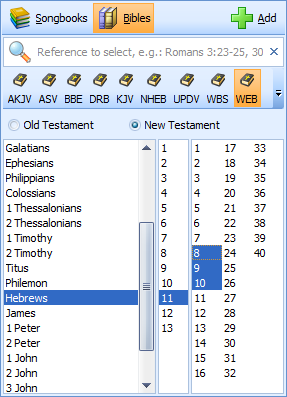 The “Bibles” tab provides access to the Bible list. Click on either the New or Old testament, then a book, a chapter and select verses with the mouse by making a selection by drag and move. Note: To select non-consecutive verses with the mouse, hold down the “Ctrl” key while you click the verses. Click on the "Magnifier" icon to go into this alternate search mode. Verses that contain the typed-in words are listed instantly.